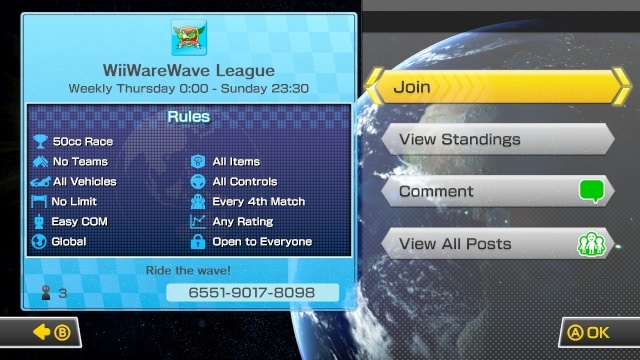 WiiWareWave League Week 1: Mario Kart 8 Tournament! It's official our first weekly Mario Kart 8 tournament has begun and the weekly tournament run's from 12:00 AM PST Thursday's - 11:30 PM PST on Sunday's! This week the winner will receive a surprise Wii Shop download code as a prize! Be sure to join our Miiverse community and setup a time or times that you'd like to participate and I'll try to join you. As the creator of the tournament I'm not counted in the rankings so if I place first, second place will win the prize! Good luck and have fun! Will you be participating in our weekly tournament? Be sure to let us know in our comments! I'm kind of letdown now. I'm kind of disappointed in the fact that you guys have already began a tournament without me, and nobody even tried to contact me. Especially, after I put a hold on the WiiWareWave GP until Rukiafan could obtain a copy of the game. I may try to participate in next weeks tournament, but that'll most likely be difficult with my work/sleep schedule. I reside in the Eastern Standard Time-zone, so I'm a few hours ahead of everyone else who resides in the Pacific Standard Time-zone. I may be forced to begin my own tournament, if necessary. Re: WiiWareWave League Week 1: Mario Kart 8 Tournament! @NINTENBRO82 wrote: I'm kind of disappointed in the fact that you guys have already began a tournament without me, and nobody even tried to contact me. Especially, after I put a hold on the WiiWareWave GP until Rukiafan could obtain a copy of the game. I may try to participate in next weeks tournament, but that'll most likely be difficult with my work/sleep scedule. I reside in the Eastern Standard Time-zone, so I'm a few hours ahead of everyone else who resides in the Pacific Standard Time-zone. I may be forced to begin my own tournament, if necessary. But I sent you a Miiverse friend message a few days ago. *schedule I apologize, for coming off being so rude like that, but I haven't had any internet connection for the past three days or so. My DSL modem crapped out on me, so I haven't had any access to the internet at all. I just upgraded to U-verse, so now I'm able to return to MiiVerse. Lol! I just sent you several personal messages on MiiVerse, in regards to your PM. Once again, I apologize for handling this situation unprofessionally. @NINTENBRO82 wrote: *schedule I apologize, for coming off being so rude like that, but I haven't had any internet connection for the past three days or so. My DSL modem crapped out on me, so I haven't had any access to the internet at all. I just upgraded to U-verse, so now I'm able to return to MiiVerse. Lol! I just sent you several personal messages on MiiVerse, in regards to your PM. Once again, I apologize for handling this situation unprofessionally. No problem my friend. I know you've been dealing with alot of issues lately so I completely understand so don't sweat it. Which symbol am I supposed to click on, so I can post screenshots from MiiVerse and view videos posted from MK8 TV?